Wow! What an amazing way to promote reading! A grand total of 109 Academy students participated in the annual Big Book Swap in the Lower School Library. During the month of March students' families and Academy community members brought in an impressive amount of more than a thousand books to swap! The girls then spent two days with their classmates swapping their gently used books. The Academy's Big Book Swap helps to give a second life to books and generates excitement for reading. All extra donations were given to the Lower School Library and classroom teachers. 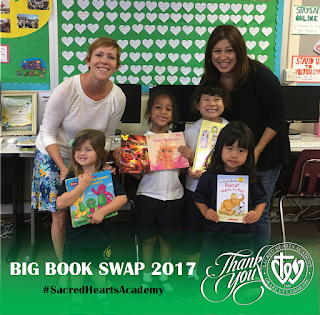 Mahalo to the countless families and parent volunteers who helped make this year's Big Book Swap an outstanding success!